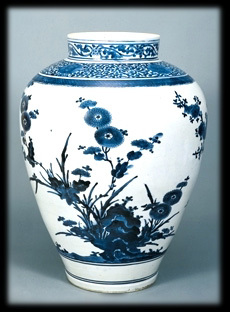 Two Chinese scenes are depicted on this storage jar. On one side, birds perch on a rock before a flowering plum. Bamboo, pine, and plum are identified as the Three Companions of Winter and symbolize the integrity of the scholar. Like these forms of nature, which continue to bloom in the dead of winter, the scholar also perseveres through hard times. On the other side is a large chrysanthemum and fantastical Taihu rock. The latter, a quintessential Chinese emblem, is found near Lake Tai in China and is often incorporated in Chinese garden designs and represented in Chinese art. Porcelain manufacture was introduced into Japan from China and Korea at the beginning of the seventeenth century. Disruption to the main Chinese kilns in the 1670s allowed the Japanese to penetrate the European export markets, and in order to satisfy the European demand for "China," they mimicked Chinese themes and styles. The main center for porcelain production was the region of Arita on the southern tip of Japan from which it was exported on Portugese and Dutch ships.